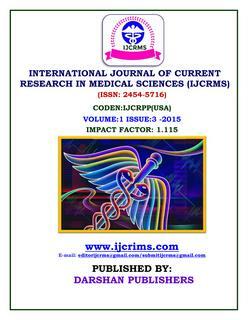 International Journal Of Current Research In Medical Sciences (ijcrms) by www.ijcrims.com (www.ijcrims.com) is licensed under a Creative Commons Attribution-NonCommercial-NoDerivs 3.0 Unported License. © 2015-2016 IJCRMS. All rights reserved.